Every year, between September and October, the terraced rice fields of Mù Cang Chải, a rural district in northern Vietnam’s Yên Bái Province, put on a show of picturesque harvest colours. 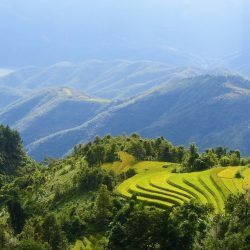 In the fresh, dew-drenched dawn, hundreds of stepped rice paddies, carved into the contours of steep valleys, are illuminated by the autumn sun. 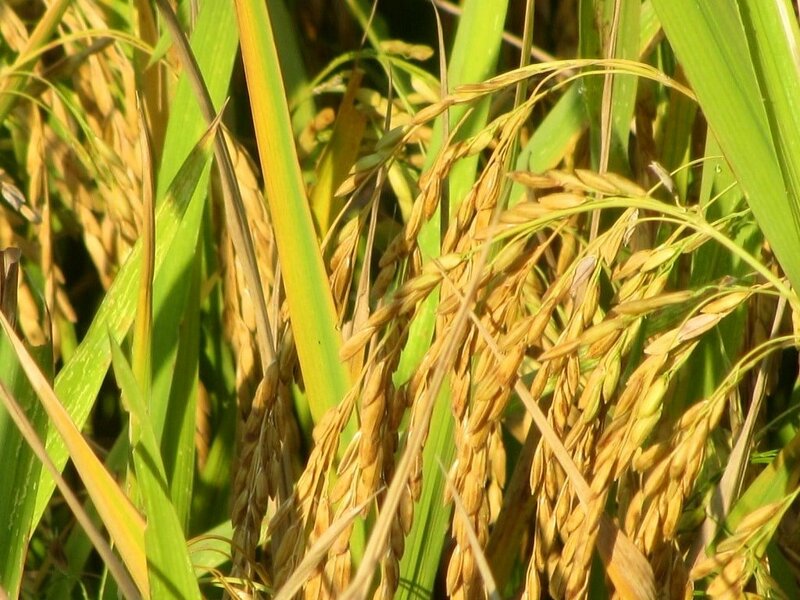 The gold-green and toast-brown colours of the ripe rice are luminous. The curving terraces, although man-made, appear to be in complete harmony with the landscape, creating a hypnotic patterning across the hills and valleys. I call this spectacle the ‘Theatre of Rice’. 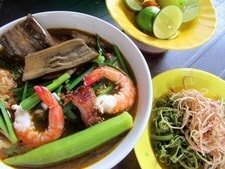 Although extremely well-known among domestic travellers and Asian tourists, strangely Mù Cang Chải doesn’t get a mention in many popular English-language guidebooks. 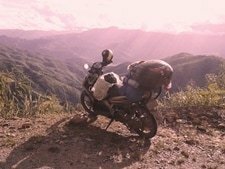 A good way to see the ‘show’ is to ride or drive along the scenic section of Highway QL32 between the small towns of Tú Lệ to Mù Cang Chải, via the lofty Khau Pha Pass. I call this the ‘Harvest Route’, covering 50km of picture-book scenery, which, in the right weather conditions, will fill your camera’s memory card within minutes. On this page, I’ve made a photo-essay of an early morning ride through the Theatre of Rice, including my annotated map of the Harvest Route with accommodation, food, and places of interest marked on it. Be warned that the area is very popular these days: on the weekends between spring and autumn it can get very crowded indeed. 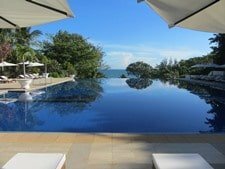 There are now loads of guest houses and homestays lining the Harvest Route, particularly around Tú Lệ and Mù Cang Chải towns. However, there are quieter, more scenic homestays on the back-roads either side of the main road, which are well-worth taking the time to explore. Rice and noodle eateries can be found in all the villages, and homestays provide home-cooked meals for guests. There are several viewing platforms and photography points along the route; there’s even paragliding available off the top of the Khau Pha Pass. 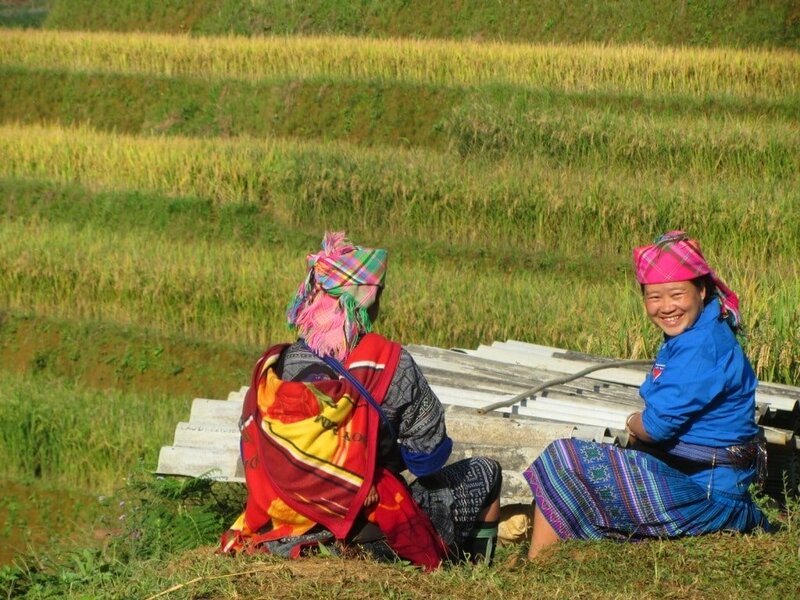 The Theatre of Rice is best seen on your own two wheels: if you don’t already have a motorbike or bicycle, they can usually be rented from your accommodation. 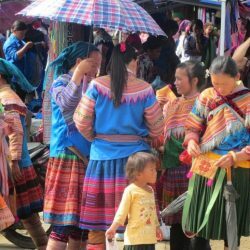 Hiring a car and driver from Sapa and making an overnight trip to Mu Cang Chai is another good option. For travellers without wheels, there are local public buses that ply Highway QL32 between all the main towns. 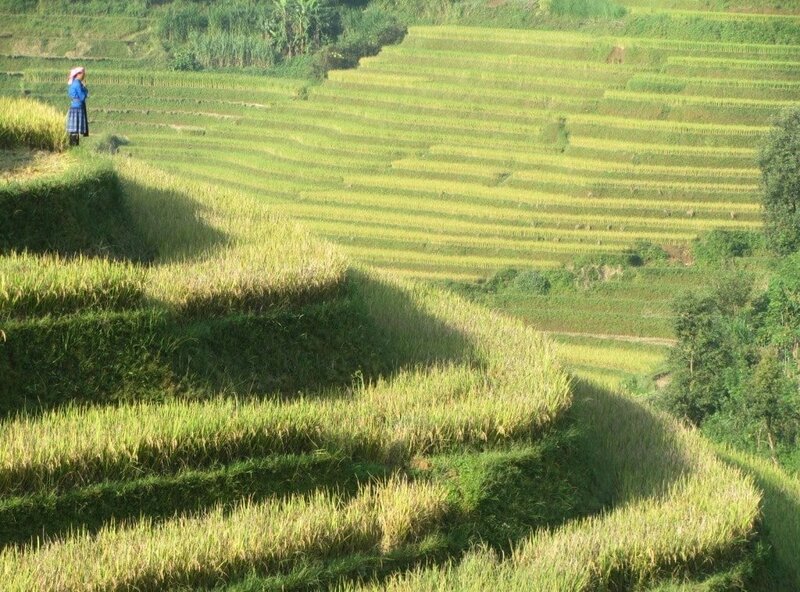 The dawn sun creeps over the valley walls, shedding light on the rice terraces. The early sun turns the rice a pale toast-brown. Women, most of whom are from one of Vietnam’s 50 ethnic minorities, make their way into the fields to begin a morning of work that often starts with a long walk. By now the morning sun fills the whole valley, revealing the extent of the rice terraces. 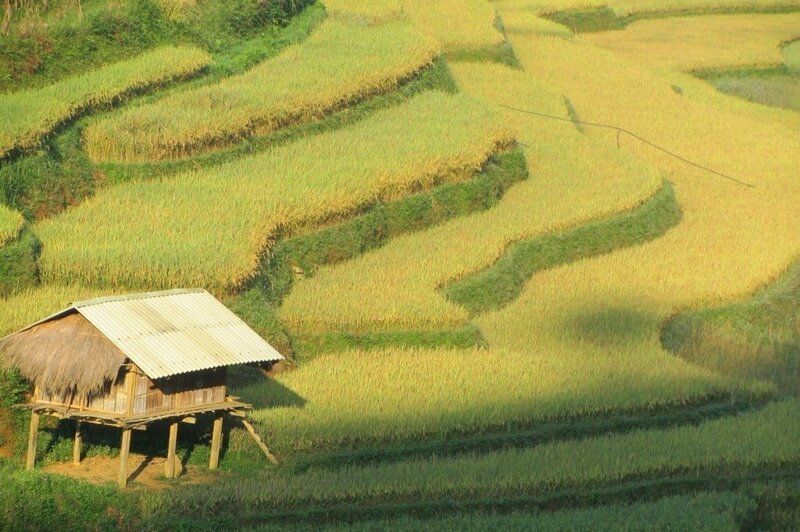 Small huts dot the landscape offering shelter and storage space for farmers during the harvest. Work begins in the fields. A local woman stands atop a rice terrace, looking down to the river in the valley below. 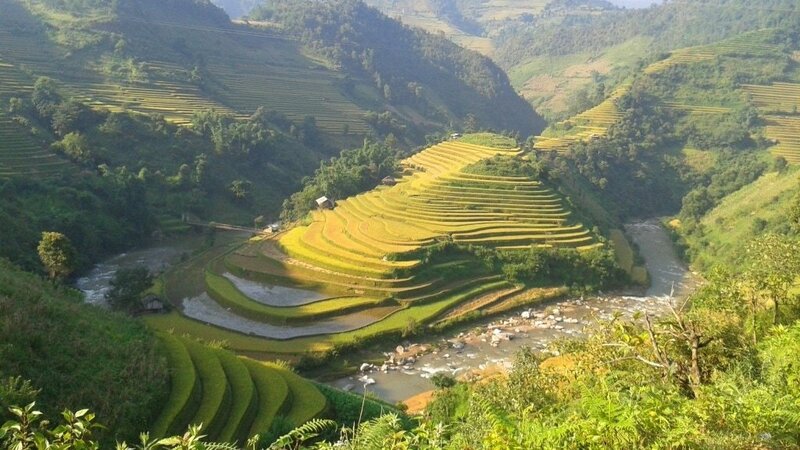 Seen from the Khau Pha Pass, the terraces look like a ‘rice glacier’, slowly sliding down the hillside. As it gets later, you’ll find you’re not the only spectator enjoying the ‘rice show’. While others watch, work in the fields goes on, with only rudimentary machinery and buffaloes to help. This is the real star of the show: rice. 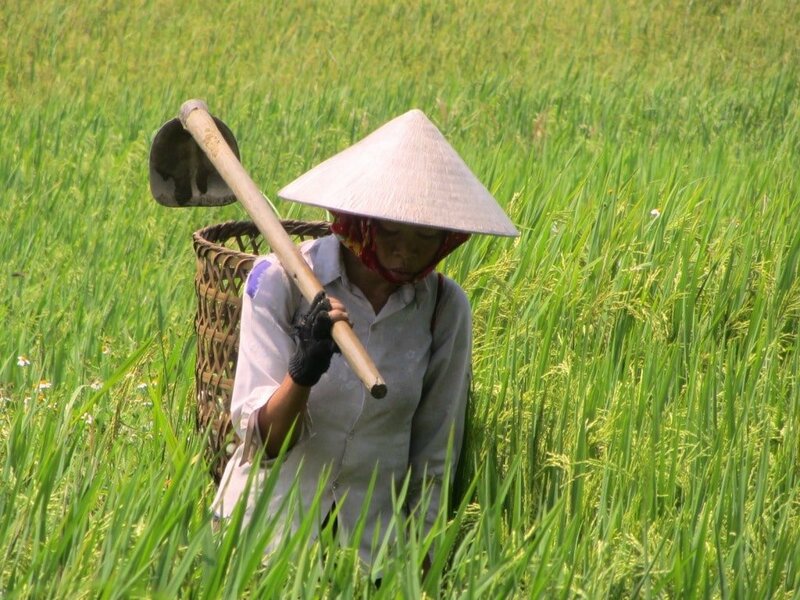 Vietnam is one of the world’s five largest exporters of the grain. The sun is higher now. The dew has gone but a morning chill lingers. The colours get warmer; even if the air doesn’t. Mid-way through their morning’s work, these women enjoy a break, before the harvest continues throughout the heat of the day. 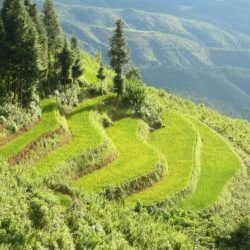 This entry was posted in MOTORBIKE GUIDES, Mountains, Northwest Motorbike Routes, The North and tagged guide, harvest, motorbike, mu cang chai, rice, terraces, travel, Vietnam, yen bai. Bookmark the permalink. 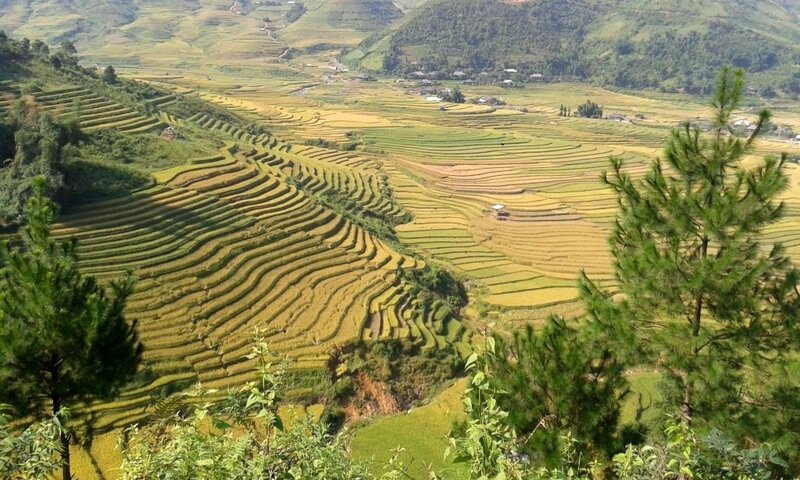 We are in Sa Pa right now and enjoying the beautiful scenery even when we just missed the harvest here of a couple of days. 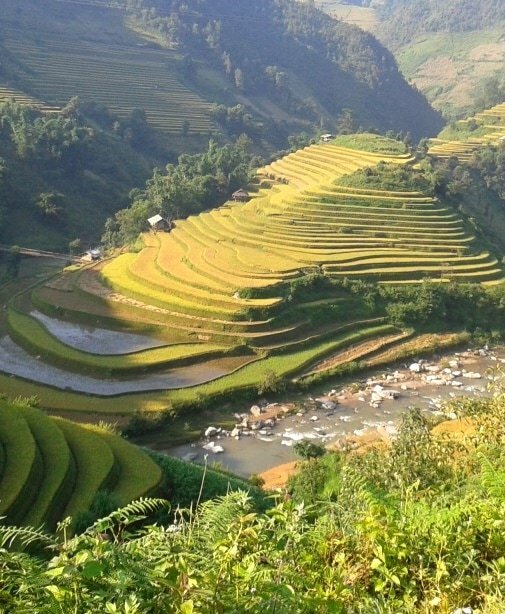 We want to take the harvest route from Sa Pa back to Hanoi. Do you know how the condition of the road (QL32) is? 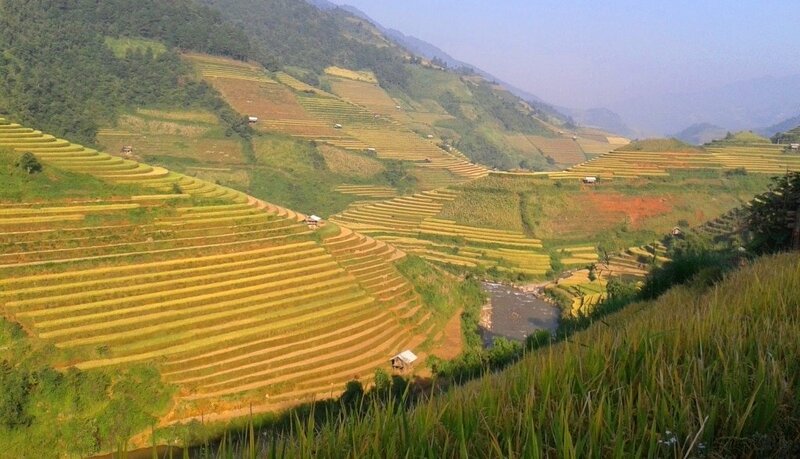 And do they harvest at the same time as Sa Pa region or do we have a chance to see the unharvested rice teracess? As far as I know the condition of road QL32 is good, unless there has been very heavy rain recently, in which case there’s the possibility of landslides blocking the road. There is a chance that some of the rice terraces at Mu Cang Chai haven’t been harvested yet – either way, it’s still a very scenic ride. Going up north from 25 october and considering to go to MCC: will it be worth it as it will be just passed the harvest time? Is this harvest by any chance late this year !? What do you recommend? 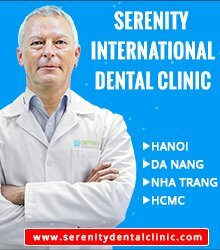 Not worth it and better go direct to Ha Giang, Quan Ba, Dong Van, Meo Vac? It will most likely be passed harvest time by late October. 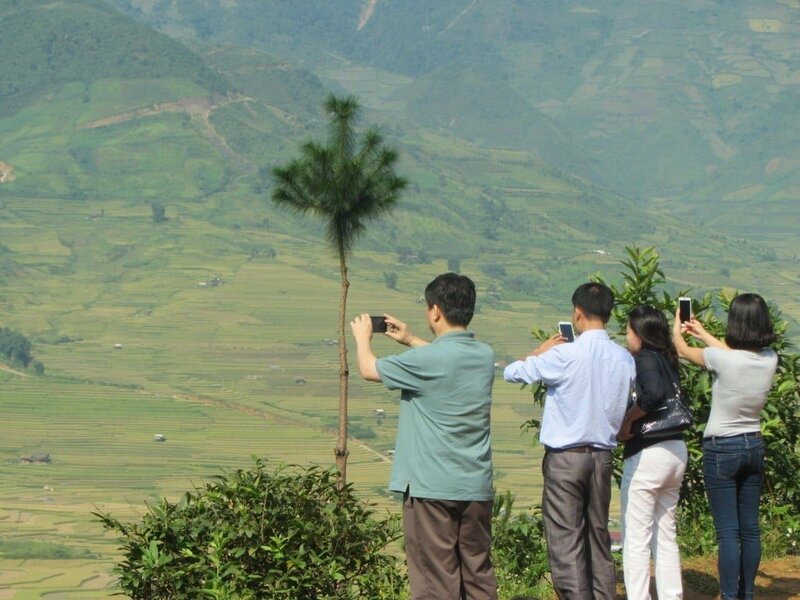 Mu Cang Chai is still a very scenic area to visit, though. 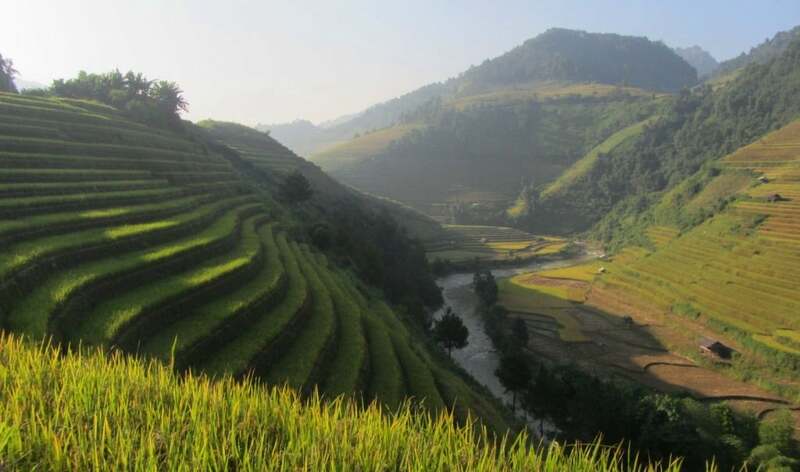 But if you have to choose between that and Ha Giang in October, then I would choose Ha Giang. Hey Tom, just wanted to clarify…is there one or two ricecrops per year in Mu Cang Chai. Until recently I’ve always been told there’s only one crop a year. But on a trip last October I was told there are two. Certainly peak time for seeing the rice terraces in bright colour and sunshine here is just before the autumn harvest, late August and September, but it changes in other regions. Thanks for all your efforts in documenting your trips and replying to questions. I’m currently in Nghia Lo and looking forward to riding this route tomorrow. I will stay at least one night in the Mu Cang / Tu Le area before heading across to DBP for a couple of days and then back to Hanoi. Thanks. Great to hear you’re enjoying the trip so far. However, I’m pretty sure the road between Nghia Lo and Mu Cang Chai is cut off at the moment, due to the collapse of a bridge near Nghia Lo and landslides near Mu Cang Chai after last week’s heavy rains. I strongly recommend checking the road situation with your hotel staff or online news sources before you set out. If you do manage to take this route, please send me an update about how you found the road conditions. 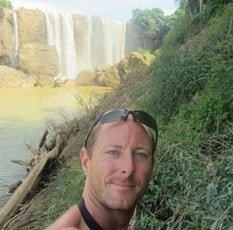 Back in VN, and this time I am doing the Northwest loop, from Hanoï to Lao Cai, through Mai Chau, Nghia Lo, Mu Cang Chai, Sapa, and I hope Sinho and Bac Ha depending on the weather conditions, using part of your itineraries of course. Today I did the Harvest road, but unfortunately it was a rainy day. When I arrived to MCC, the sun arrived. Just dropped by bag to my homestay and went back on the road to go back and forth to the pass. Amazing scenery. The paradise of rice paddies lovers and photographers!!! Thanks again for your website on which I discovered Mu Can Chai. By the way, for those who don’t want to stay in Nha nghi on the main road, there is a couple of charming wood made homestays next to each other, right after the bridge at the center of the town. Cross the bridge, turn left and continue on 300m. Three houses with chinese lanterns are just there. Cost 400,000 dong per night incl. a great dinner, breakfast and wifi!!! Much better option in my opinion. Good to hear you’re back in Vietnam and enjoying it again. Great that the sun came out for a bit so that you could see the ‘rice show’. Thanks for the suggestion about the homestays – they sound like a good deal. 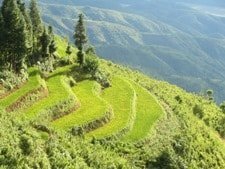 I’m heading up to Sapa in a few days and thinking of passing through Mu Cang Chai. Will there be much to see at this time of year, or have I missed it? Thanks! The rice fields probably won’t be as colourful as there are in these images at this time of year, but it should still be a very pretty ride, so I think it’s worth it. I hope the weather is good for you. Currently in Hanoi planning on riding all the way down to saigon along a variation of the “classic route” posted on the site. Just wondering if it would be worth taking a few days to detour up north to see these terraces. I would be heading there at the beginning of july. You mentioned harvest isnt until september and october, so what’re your thoughts? 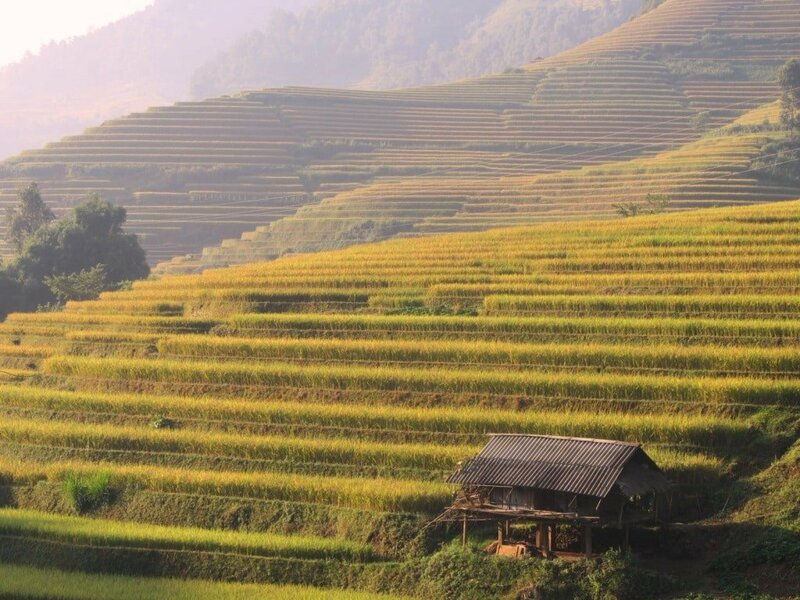 Yes, I think it’s a good idea to start your trip with a detour to see the rice terraces at Mu Cang Chai, as long as you’ve got a bit of time to spare. July is just before the harvest, so the colours should be good and bright then. There’s a chance of rain, but there’s not much you can do about that! Thinking of going here in October. How far is it from Hanoi? 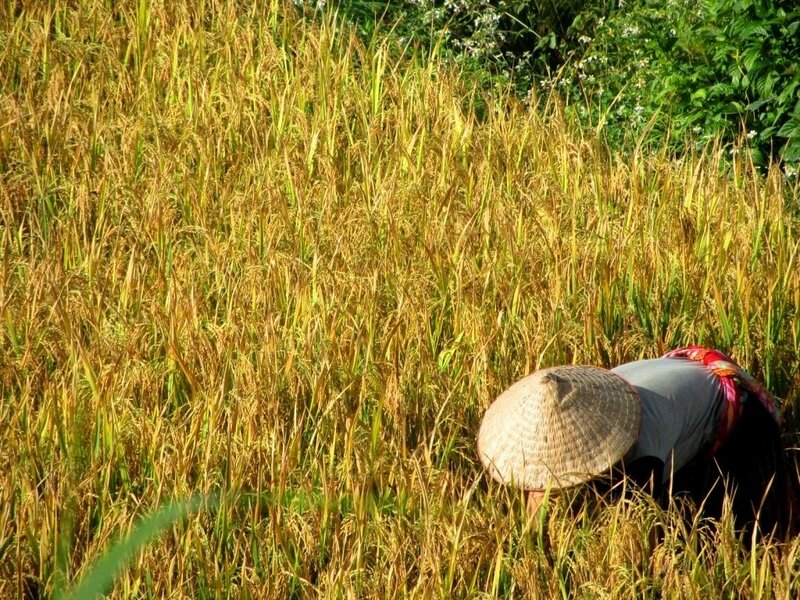 October should be a good time to go – but the earlier the better: because that’s harvest time, so the later you leave it the higher the chance that the rice will have been cut. I went late September and it was perfect. By the time I was in the northeast, in mid-October, the rice fields had already been harvested, and so the landscape didn’t look quite as spectacular. The Harvest Route is roughly 250km from Hanoi. You can get there in a day if you leave early in the morning. The second half of the drive is very scenic. But some sections of road were under partial construction when I last visited (2014).